I was tasked with making some changes to a site today over FTP. It seems odd that people are still OK with letting developers push and pull files from FTP without so much as a change log or automated linting, testing, etc. Anywho, I tried to find my cowboy hat but it snowed yesterday so all my summer gear is put away and since it’s moderately inappropriate to do cowboy things while looking like a snowboarder, I had to come up with a better way to make working on files over FTP less Wild West and more Gnar Gnar. Setup a cron script to maintain a local mirror of the remote FTP using lftp and automatically commit the changes to a hosted git repo. Execute a reverse mirror lftp script to push the local changes to the remote FTP host also deleting the files no longer relevant. It’s been a long time since I’ve wiped out my workstation and started with a fresh Operating System. Â I’m starting to get a real solid grasp of OSx so a clean slate to work with sounds fantastic. Having a much better knowledge then I did a year ago about the apps I like, which apps to I definitely don’t like and in what combination I find them most useful. Â So here’s a quick breakdown of the OSx Apps I use while things backup backup before I race down green-glass lane, nuke this MacBook & arrive at destination defaults. Plugins – Chrome sync takes the thought n’ effort out of this. Â These are all extensions I have loaded in chrome. Â The ones in red I just keep disabled unless I need em in which case their two clicks away from bing functional. I rarely use it now however given that it’s paid for… Â It’s still noteworthy to mention that I use VIM much more often. GIMPÂ -Â All my graphics editing needs under one easy to use roof. VLCÂ -Â Have Video File… Will Play. Flow charts, Wire Frames, Brain Storming, Network Maps, Visual website site maps… Â and whatever else you can think of once you get good at using it, it’s hard not to. FreeMindÂ – Offline Mind Mapping otherwise I use MindmeisterÂ $$Â w/an entry level paid subscription. SkypeÂ – I still use this every other day or so but it’s usefullness is fading extremely fast in the face of Google+ Hangouts. Jing &Â Snagit – Screenshot + annotation & sharing tool. This shouldn’t be listed here. Â I can’t recall the last time I used this. VirtualBoxÂ – Virtual Machines for all! TrueCryptÂ – Â It’s all encrypted. Â Everything. Â Thumbdrives, backups, shared containers. Â Everything. QuickSilverÂ – Cutting shortcuts and mashing mashups for super quick access to everything. GPGToolsÂ – This stuff should be understood now. HomebrewÂ – An OSx Packaging system that’s as useful as it is easy. oh-my-zshÂ – Useful & Pretty. 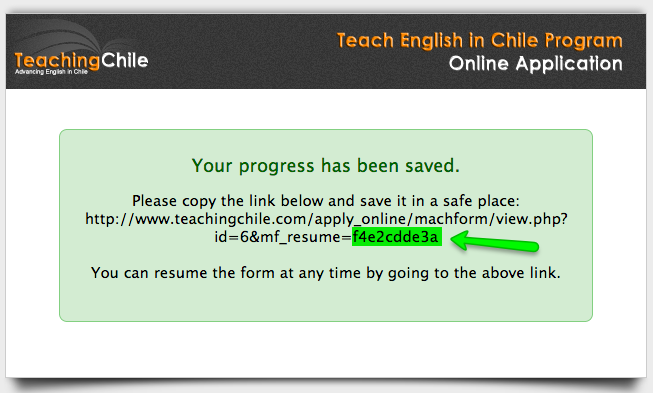 TeachingChile.com is completely wrapped in SSL. This post is no longer entirely relevant. TeachChile.com has updated their site and wrapped it in SSL. Thanks guys! 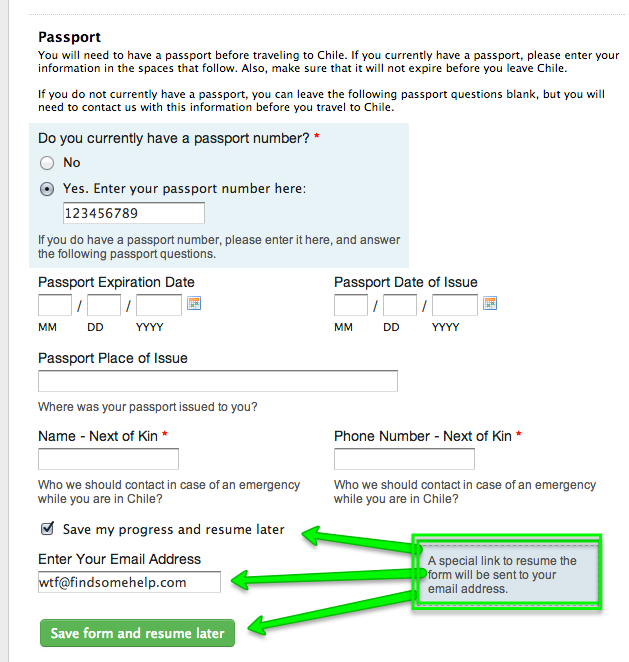 TeachChile.com has an online application process that requires the submission of quite a bit of personal information including your Passport Details over plain text. Seriously? I almost feel like someone’s playing a prank here. Â with SSL and ‘secure websites’ being pretty well understood it’s mind boggling to see websites like this still exist requesting personal information including passport number be submitted via plain text non-secured form data. What’s more amazing is that the lack of SSL is just one of what seems to be a whole ton of security-ignorance which pretty much guarantees anyone submitting data to these guys gets their identity (all their submitted data) jacked. Wha? Google shows some love. What makes it more astonishing is the domain was registered in 2005 and ranks #1 for “Teach in Chile” on google(us) and ranks really well for quite a few other keyword phrases.Â With the potential traffic exceeding thousands of visitors a month – I wonder how many fill out that insecure form? Google gives the page that links to the Non-SSL encrypted page a PageRank of 3.
http://teachingchile.com/to_apply.htmÂ – With all the crazy search listing algorithms and such you’d think Google wouldn’t demonstrate much appreciation for this. WTF? Guess until you find a stored form! and upon saving you are presented with a ‘special link’ which at a quick glance looks like a simple 10 character alphanumeric hash. Link to permanently saved form. As far as I can tell that is permanent unless they purge the system of old resumable forms at some point. But to drive my point home – all one has to do is generate hash values 10 alphanumeric characters long. The following function ‘should’ generate those hashes. Â Can’t say I checked but it is quite that simple. Replace the ‘special’ part of the resume URL with generated hash & test for live data. There can’t be more then 6.something quadrillion hashes possible used to uniquely identify the Â saved forms are in their database. Â 6 Quadrillion is a lot, don’t get me wrong but it’s really not if you break the work down across 1 thousand, 10 thousand or even more computers it becomes pretty easy to pull the task off in a very short period of time, even if approached in a slow enough manner as not to bring their web server down. Â I’m digressing though – this isn’t the school of brute-forceology. If I were to assume TeachChile.com was using Mach Forms (which they are) based on ‘machform’ being in the url or some other simple means then a quick Google search for existing (and very well documented)Â Mach Form exploits might apply. The latest exploit having been uncovered less than two months ago.Â Â *shakes head* … I’ll just stop there on the topic of exploits. The purpose of this post! Rosetta Stone in hand and Netbeans on screen I’ve taken to two newÂ languages. Â I have for quite a few years now wondered why I don’t have a firm grasp of Java and considering I’m an avid developer capable of effectively supporting furthering development of applications sourced in Perl, Ruby and PHP (yeah, I’m a web developer – ya got me) there’s really no reason why I shouldn’t have a solid grasp of Java at least to the level of being able to comfortably support an open source project if nothing else. Â What makes the deal really sweet thought is that Zahira is brilliantly intelligent beyond any claim I could make here and she’s motivated to learn and understand the use of Java so that just seals the deal. Â I’m personally 100% confident Java will be commonplace in our household within months. On an entirely different thought process I have become the average american and seemingly let go of any ability to be understood by any means other then this sadÂ representationÂ of written and spoken language most of us call English. Â Normally when I felt like this I would force feed some spanish and submerse myself with a vacation or enlist someone to communicate with me in spanish at some semi-regular interval. Â This time however I’m in an awesome new situation in which many people in my immediate bubble can speak in Arabic so I’m taking theÂ opportunityÂ to jump in and for the first time in my 30 years of espanglishÂ existenceÂ I am taking on a truly new language. The notion of copy/pasting some Arabic here crossed my mind but I’m at such a lack ofÂ knowledgeÂ that I’m going to submit this post and begin dedicating some time to understanding it right now.